a form of protein-calorie malnutrition occurring chiefly in the first year of life, with growth retardation and wasting of subcutaneous fat and muscle, but usually with retention of appetite and mental alertness. It is considered to be related to kwashiorkor. Infectious disease may be a precipitating factor. adj., adj maran´tic, maras´mic. Cachexia, especially in young children, primarily due to prolonged dietary deficiency of protein and calories. A progressive wasting of the body, occurring chiefly in young children and associated with insufficient intake or malabsorption of food. a condition of extreme malnutrition and emaciation, occurring chiefly in young children. It is characterized by progressive wasting of subcutaneous tissue and muscle. Marasmus results from a lack of adequate calories and proteins and is seen in children with failure to thrive and in individuals in a state of starvation. Less commonly it results from an inability to assimilate or use protein because of a defect in metabolism. Care of the marasmic child involves the reestablishment of fluid and electrolyte balance, followed by the slow and gradual addition of foods as they are tolerated. See also kwashiorkor. A state of severe malnutrition due to reduced ingestion of protein and calories, which can be as a result of poor diet, eating habits, parent-child relationship or metabolic defects. Failure to thrive, weight loss, emaciation, decreased skin turgor, skin and muscle atrophy; children have a wizened appearance, are listless, have abdominal distension and oedema, “starvation stools”, hypotonia, hypothermia, and reduced rates of metabolism. 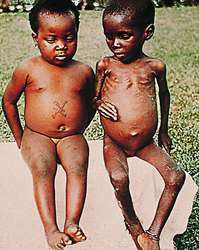 A state of severe malnutrition, due to ↓ ingestion of protein and calories, due to poor diet, feeding habits, parent-child relationship or metabolic defects Clinical FTT, weight loss, emaciation, ↓ skin turgor, skin and muscle atrophy; children are wizened, listless, abdominal distension and edema, 'starvation stools', hypotonia, hypothermia, ↓ metabolism. Cf Kwashiorkor. Synonym(s): Parrot disease (2) . A state of wasting or emaciation from starvation, usually in infants. There is weakness, irritability, dry skin and, unless rapidly corrected by feeding, retardation of growth and of mental development. Severe malnutritution in children caused by a diet lacking in calories as well as protein. Marasmus may also be caused by disease and parasitic infection. Jules Marie, French physician, 1829-1883. Cachexia primarily due to prolonged dietary deficiency of protein and calories. n a wasting disorder of malnutrition and partial starvation which occurs in infants and young children as a result of severe protein deficiency and insufficient caloric intake. See also kwashiorkor. a form of protein-calorie malnutrition characterized by growth retardation and wasting of subcutaneous fat and muscle, but usually with retention of appetite and mental alertness. See cobalt nutritional deficiency. The <<Unidad Vida Infantil>> at the Francisco Valderrama Hospital, under advice from Universidad de Antioquia, addresses issues of severely malnourished children (with marasmus or kwashiorkor) in the area of Uraba, Colombia. The rate of infant mortality, or marasmus, among orphans often has reached incredible heights. The biochemistry and physiology of kwashiorkor and marasmus. Perhaps some kind of crisis would save us from this Chinese marasmus. The wanting, the craving of Grief (Here quote from Shakespeare's Constance in King John, and from the Greek Tragedians--& in all the passions I purpose to make free use of illustration from the Poets, especially Dante, Chaucer, Shakespear and Ben Johnson) the characteristic Supersession of the Appetite of Hunger--the equally characteristic wasting and marasmus of Grief--all these & there are many more, prove Grief to be a Hunger of the Soul. The embodiment of grief: passion and rhetoric in Coleridge and the "new rhetoricians"
Lacking both critical distance to understand whence his emasculation comes and the intelligence to theorize himself out of it, Brick has little else to arm himself against his sexual marasmus than the childlike finger pointing he resorts to in the story, an accusation which, by the story's end, even proves entirely justified given that Margaret's actions are presented as those of an emasculating wife. Doctors had to seek advice from the World Health Organisation before they could treat the boys for the wasting disorder marasmus. A doctor who had worked in India had to take advice from the World Health Organisation on how to treat the boys, because he had never seen a case of marasmus - intense emaciation due to malnutrition - in the UK. Nor had he previously come across a case of the wasting disorder marasmus in the UK and had to take advice from the World Health Organisation on how to treat them. Among Samia, marasmus in children is perceived as an element of a number of other social disharmonies engrained in the notion of ekhira, the latter resulting from a breach of moral values. 2) Marasmus is one of three forms of serious protein-energy malnutrition (PEM); the other two are kwashiorkor (KW) and marasmic KW.